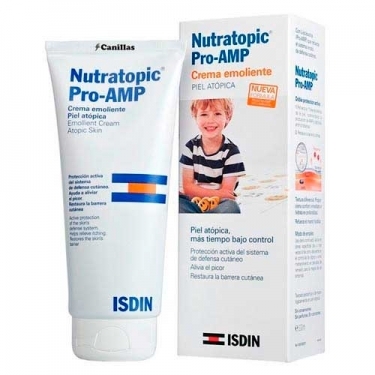 DESCRIPTION: Nutratopic Pro-Am Emollient Cream from Isdin is a cream indicated for daily hydration of atopic skin, especially for the crisis and extremely dry areas. Suitable for children and adults. It's thicker texture allows deeply nourishing the skin, but at the same time allows it to be easily applied. 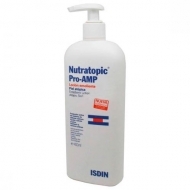 Pro-AMP and Rhamnosoft treat the skin from within and at the same time, preventing the adherence of bacteria, helping to prevent infection. 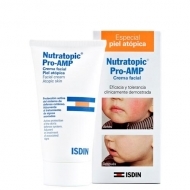 It also acts on itching and redness, soothing the area and prevent further scratching damage. Apply to clean and dry skin at least twice a day by gently massaging.